I know some gave Marty a lot of slack for not doing enough, but when I contacted his office several years ago after the 2010 service cuts, he agreed to work with me to get several lines restored: B2, B31, B64, X27, X28 and the B4, and just about all of them have been fully restored. He also fought to get the current express bus fleet for the X27, X28, X37 and X38 after constituents complained about old and dirty buses. 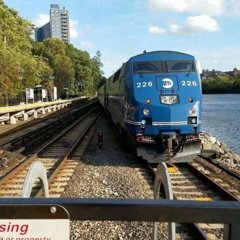 It took several years before weekend service on the X28 was restored, but we worked tirelessly to get it back when the MTA told riders they could take the train. Numerous petitions started for that and I have to say that just about all of the elected officials then in the district were willing to help. He should be commended for that for sure. Best of luck to Mary and to Andrew. As partisan as I am and can be, he seemed like an effective legislator (based on the little bit of NYS political news I can find). Hard to see the possible good ones go in a wave, but here's hoping his successor is as good or better than he was. Well this is what people wanted and if that's the case then fine, but he'd better deliver, and I want to hear the same criticisms if he doesn't. If anything, his view on social issues (and other comments/events) did him no good. Thing is that area now has more of a mix of people from both parties, despite it being previously Republican safe territory. However, I do hope that the incoming senator works with the community on transportation related issues. It's frustrating when politicians decide to focus on other issues when transportation is important as well. Completely dreadful presence in NYS, xenophobe and enemy of transit outside of his own car (quite literally killing citizens as he rolled along). Won't be missed. You guys are welcome to downvote without providing any reasonable feedback or analysis. I stand by everything I said, and Google is your friend--his record speaks for itself, and anecdotes about phone calls made to his office are fairly worthless in the scheme of things. Should we talk to the family of the woman he struck and killed in 2005? I worked with him personally to restore transit, so I disagree about your transportation comments. No one is calling him a saint, but he served the district for 16 years and overall did so well. To say that he accomplished nothing in 16 years which is what you're trying to imply is ridiculous and you're only doing that because he's a Republican. Meanwhile if it was a Democrat, nine times out of ten you'd look the other way and make excuses. How about we talk about the disaster that was last week with that "snow storm"?